We had lots of fun at the Raspberry Pi 5th Birthday Party this week end. Lots of fun workshops, entertaining talks and a chance to catch up with some interesting people. My kids loved Spencer Organ's Harry Potter themed micro:bit workshop. Turns out my 10 year old is actually getting much quicker at typing. My 8 year old loves Harry Potter and enlisted his Dad to help with the typing. Spencer ran the session with loads of enthusiasm and allowed everyone to work at their own pace. The kids loved getting to keep their glue LED dragon eggs! They also had a great time at Joshua's EduBlocks session where they got to program Minecraft Pi using a block-based interface. My 8 year old found this much easier that typing Python and my 10 year old is starting to learn Python so he really appreciated the direct mapping to Python. My kids were also really inspired by the music and art themed talks and workshops. They both want to do more music and art programming. My 8 year old loves the idea of using his electronic guitar with Sonic Pi and they both want to make a music box and try some art programming with Processing. Thanks to Mike Horne for presenting his music box project complete with mistakes and things that could be improved. It's great for kids to see that a project doesn't have to be perfect to be fun. We also got to catch up with some current crowdfunding projects. 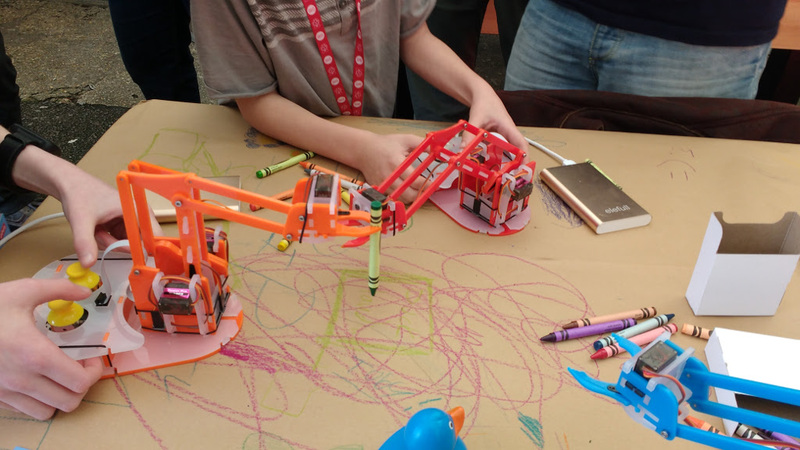 The kids got to try controlling MeArm Pi robotic arms and were very pleased when they managed to transfer a crayon from one arm to another. The MeArms are also programmable from lots of different languages and are built from a kit. We also got to see the RaspIO programmable LED shapes which come in a variable of shapes including triangles which can be built into a pyramid. And we got to meet up with the lovely folks from Pimoroni and talk to them about our recent Flotilla Scratch project which allows you to program the gorgeous Flotilla kids electronics range from Scratch 1.4 on the Raspberry Pi. Of course we bought a Raspberry Pi Zero W and came home with lots of other stuff to try out.